Israeli water consumers are being urged by the government to do everything to conserve the precious commodity that is becoming more and more scarce in the entire Middle East. The new conservation push comes after officials announced that last month was the driest November on record since 1968. Meteorological forecasts predict that winter rainfall will fall short of normal for the sixth year running, and might be the driest since records began being kept in 1927. 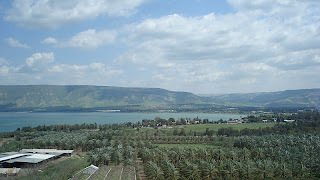 Officials also recently announced that the country’s main natural fresh water reservoir, the biblical Sea of Galilee, is currently dropping by over one foot every day due to evaporation and the low level of water entering the lake from the northern portion of the Jordan River. Officials say residential water use in Israel take up almost half of all available daily resources, while agriculture uses over half of that amount with industries consuming the rest. Several desalination plants which will help alleviate the water shortfall are currently being constructed, but the first one is not scheduled to go online until 2013.